Government machinery in Haryana has virtually come to a standstill with authorities at all levels taking more than a keen interest in the upcoming nuptials of Chief Minister Bhupinder Singh Hooda's son, who is a member of parliament himself. Deepender Singh Hooda, 32, is to marry Gurgaon-based Sweta Mirdha in Jaipur on Sunday. Hooda's home town is in standby mode as minister is hosting lunch for around 20,000 people. The actual wedding ceremony at Jaipur is also expected to be a big affair considering it is being seen as a marriage of two top Jat community clans. Sweta is the daughter of senior Rajasthan Congress leader Ram Prakash Mirdha and granddaughter of the late Nathuram Mirdha, a senior Congress leader who served as a federal minister. Sweta's elder sister Jyoti Mirdha is currently a member of Lok Sabha from Rajasthan's Nagaur constituency, while Deepender represents Rohtak constituency of Haryana. Together they may make a rare brother-in-law-sister-in-law combination in the lower house of parliament. Jat leaders and supporters, who had gathered at the rally, organised for the reservation of the community at Ramlila Maidan on Sunday were angry with the electronic and english print media for there non-supportaive approach in covering the rally and biased reporting of the same. General Secretary Pushpendra Singh said,"Please go through the Times of India and Hindustan times news related with Jat OBC Reservation rally at Ramlila ground, Delhi and compare it with Hindi print media. We were expecting that at least print and electronic media will help us for this demonstration but it looks like Indian media work for political parties and prefer at power/govt side". "Yesterday we called up every single channels and nobody responded. Over a lacs of jats gathered there despite the fact full government machinery was there to sabotage this", he added. Rajiv urged the media to be little bit sensitive about real issues, as now people are aware of every news through various source of information. He praised the Hindi newsmedia for there positive reporting on the rally and thanked them on behalf of entire Jat OBC community. Dr. Giri Raj Singh Sirohi is a scientist by profession. He had carried out research in Antarctica, South Pole in 1960 for around 100 days in sub-zero temperatures. To recognize Dr. G.S. Sirohi's research on South Pole on Biological Clock, the US Board of Geographical names named a point at 83 57 S. Latitude, 170 06 E. Longitude as SIROHI POINT to honour Dr. G.S. Sirohi. Later he carried out further research in India since mid 1960s - 1989. Career and work: He worked as Head & Professor of Plant Physiology Division,Indian Agricultural Research Institute, Pusa, Delhi, India. He was responsible for growing this small division of a few people into a full fledged division with state of the art research equipments like photo-spectometer etc. He was main anchor to bring in a crore of UNDP project for Plant Physiology and worked hard to provide best of research in his field. Childrens book - With a view to generate interest in science in young children he co-authored an autobiographical book for children, Penguin Books, India . * On 7 January 2003, on behalf of "Indian Society for Plant Physiology", he was presented the Lifetime achievement award by Sh. Kalam, President of India. * Indian Society for Plant Physiology (ISPP) every year presents an Award called Dr. G.S.Sirohi Award . This Award was instituted by the society in the year 1999 for the best article published in Indian Journal of Plant Physiology and presented every year during annual meeting. Personal Life: Dr. G.S. Sirohi was born in a village in Kheri, District Bulandshehr, Uttar Pradesh. His father Sh. Ganga Prasad was a Daroga in Police and his mother is housewife. Realising an inevitable power show of JAT community under the leadership of Mr. Yashpal Malik on forthcoming 8th February 2010, Congress have come out of long slumber and its UP In-charge Shri Digvijay Singh has released a statement in favour of considering OBC reservation for JATs at central level. 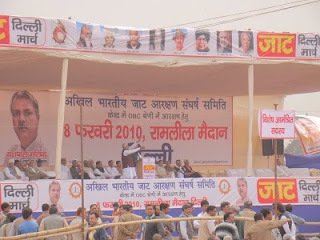 Besides this congress has also organized ‘Kisan- Mazdoor’ rally in Muzaffarnagar on 5th February 2010 to mislead the JAT community wherein Shri Digvijay Singh and Shri Rahul Gandhi are also expected to participate. In the news published in some news papers Shri Digvijay Singh has advocated OBC Reservation for JATs of UP admitting that JATs of UP are already included in OBC Category at state level and hence should be considered for inclusion in OBC Category for Jobs and admissions in education institutions at the central level. Shri Yeshpal Malik the National president of Akhil Bhartiya Jat Arakshan Sangharsh Samiti launched a scathing attack on Shri Digvijay Singh thecongress leader In-charge for UP for misleading the community by saying that the matter has been referred to Ministry of Social Justice and Empowerment. Shri Yespal Malik has asked when Congress is in power at center where is the need of following an unnecessary long process in taking such an administrative decision. Shri Malik said, “The State Governments of Congress party had announced OBC reservation for JATs of Delhi and Rajasthan earlier at state level and now our demand is to extend the OBC reservation to JATs at central level so that our rural and poor peasantry class can benefit in JOBs and admissions in educational institutions. Shri Malik alleged that Congress is still indulged in divide and rule policy and is discriminating amongst the JATs on the state basis. ” For example the JATs of Rajasthan (excluding Bharatpur and Dholpur) are included in OBC category at the central level whereas they are not even included in state OBC list in Haryana. Mr. Malik said that ABJAAS is not only in favour of reservation for the Jats in Uttar Pradesh but also demand the same in Haryana, Delhi, Himachal Pradesh, Rajasthan and Uttarakhand. In the news released from Shri Digvijay Singh of Congress party they have also hinted at Shri Rahul Gandhi’s plans for 2012 assembly election of UP. Shri Malik told that the forthcoming “JAT Delhi March” on 8th Feb. 2010 would be historical when JATs of UP, Haryana, Delhi, Punjab and Rajasthan would show their strength in Delhi.